Saratoga Flag takes great pride in participating in numerous Veterans Day Parades. 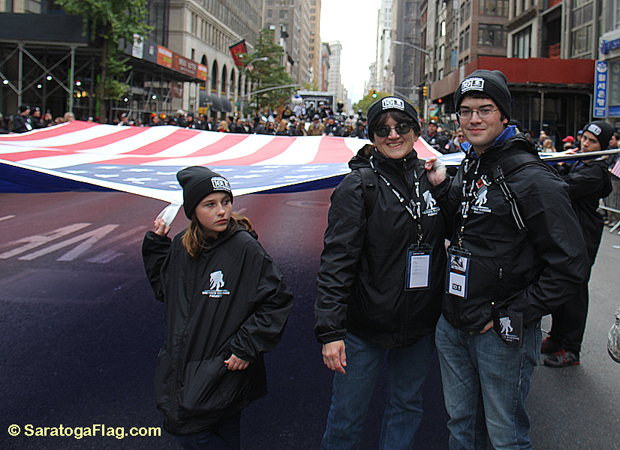 Please take a minute to view excerpts from the 2015 NYC Veterans Day Parade, where we marched with the Wounded Warrior Project and thousands of Veterans up Fifth Avenue in Manhattan. We Honor Those Who Serve and have served, every day! Veterans Day is an official United States public holiday, observed annually on November 11, that honors military veterans, that is, persons who served in the United States Armed Forces. It coincides with other holidays, including Armistice Day and Remembrance Day, celebrated in other countries that mark the anniversary of the end of World War I; major hostilities of World War I were formally ended at the 11th hour of the 11th day of the 11th month of 1918, when the Armistice with Germany went into effect. The United States previously observed Armistice Day. The U.S. holiday was renamed Veterans Day in 1954. Happy Howl-O-Ween from Saratoga Flag Co.
Saratoga Flag takes great pride in manufacturing the finest quality flags and banners for Special Events year-’round. Please take a moment to view a video of our special Halloween Project, which can be viewed annually on North Broadway, near Skidmore College, in the City of Saratoga Springs, New York. https://youtu.be/n3n-9Eu8HfE. Enjoy a safe Halloween Holiday, filled with more treats than tricks! *Halloween, or Hallowe’en (a contraction of All Hallows’ Evening, also known as Allhalloween, All Hallows’ Eve, or All Saints’ Eve, is a celebration observed in a number of countries on 31 October, the eve of the Western Christian feast of All Hallows’ Day. It begins the three-day observance of Allhallowtide, the time in the liturgical year dedicated to remembering the dead, including saints (hallows), martyrs, and all the faithful departed. Saratoga Flag is a small family business, which takes great pride in supporting non-profit organizations in Saratoga County and the surrounding region every year. This blog post is highlighting one such group: “The Lake Theatre,” in Residence at the Holiday Inn- Lake George Resort, for the past 49 years. The Lake Theatre has produced a delightfully entertaining production of “Almost, Maine,” a romantic comedy written by John Cariani. The Holiday Inn dinner-theatre venue provides a pleasantly intimate setting for live theatre, where you are up close and personal with very talented New York City actors on stage. Audience members can choose to arrive early for the full dinner (or lunch), or choose to attend the live matinee or evening performance without a meal. Read more about the production in The Post Star and The Saratogian Newspapers. “Almost, Maine” runs from July 21- September 3rd, 2016. “Southern Comforts” (another romantic comedy) runs September 15 – October 22, 2016. See Link https://laketheatreproductions.com/shows/ for tickets or call the **Box Office: (518) 668-5762, extension 411. **MENTION THIS BLOG POST and Discount code: “Flyer” for additional savings at the Box Office. MORE SAVINGS! —- SPECIAL OFFER: Bring your ticket stub from the show, back to Saratoga Flag (by November 1, 2016) for a $10.00 discount off any USA Flag (minimum purchase: $29.00). Saratoga Flag is very exciting to see their recently re-designed New York State Flag on the National Stage at Presidential Campaign stops, for both Republican & Democratic Candidates, in Upstate New York! Read more about the NYS Flag here. Order the Updated NYS Flag here. Wendy Lewis, Sr. VP Diversity, Inclusion & Strategic Alliances at Major League Baseball (left). Major League Baseball promotes Supplier Diversity at the MLB Diversity Business Summit. This year’s conference was held at Chase Field, home of the Arizona Diamondbacks, in Phoenix, Arizona. Saratoga Flag had the great opportunity to take part in the event again this year and is very pleased to supply a growing number of Major League Baseball Clubs with Custom flags, banners, USA Flags, specialty flags and accessories, ALL MADE IN USA! Roberto Clemente, Jr., ballplayer, broadcaster & son of Roberto Clemente Sr, Puerto Rican MLB legend, player for the Pittsburgh Pirates (1955-1972). Read More about the 2016 MLB Diversity Business Summit here. The New Saratoga Quarter Coin was unveiled today, in Schuylerville NY, location of the Surrender of the British Army, which occurred in 1777. The Ceremony was held at Schuylerville High School, in Saratoga County, New York. The Saratoga Battlefield is just 10 miles South of the location of the Surrender. Watch our video from the Ceremony…. At Saratoga in the autumn of 1777, American forces met, defeated and forced a major British army to surrender. This crucial American victory renewed patriots’ hopes for independence, secured essential foreign recognition and support, and forever changed the face of the world. The battlefield, a monument to the fallen and the restored country house of American General Philip Schuyler make up the three sites of Saratoga National Historical Park. It was established as a national site in 1938. The design depicts a close-up of the moment General John Burgoyne surrendered his sword to General Horatio Gates, a turning point many believe marked the ‘beginning of the end of the American Revolutionary War.’ Inscriptions are “BRITISH SURRENDER 1777,” “SARATOGA,” “NEW YORK,” “2015” and “E PLURIBUS UNUM.” Design candidates were developed in consultation with representatives of Saratoga National Historical Park.